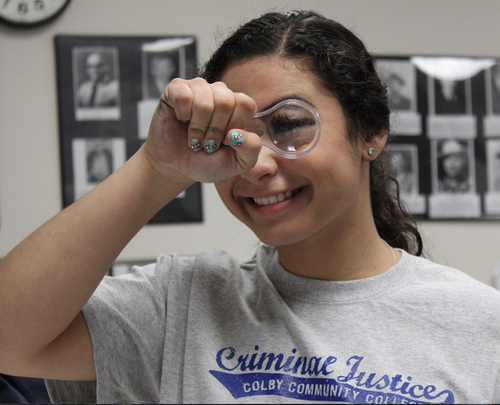 Forensic textbook study comes to life with hands on analysis of the everyday world. Criminalistics class is forensic science. A criminalist is a forensic science specialist. Our class covers the past and present of crime scene investigations, evidence collection and analysis, and reporting. This is an elective course in Criminal Justice that studies Forensic Science as a significant element in efforts to control crime and at the same time maintaining a high quality of justice. Looking back towards the beginning on my fascination with true crime, it all began with the classic serial killers ranging from Dahmer to the Zodiac. The first thing I remember doing after seeing a photo of Richard Ramirez smiling like the devil himself on the television when I was around 12 or 13 years old was asking my mom for her computer and searching up what makes somebody a serial killer? Now, I can’t remember whether or not I was searching for a psychological answer but the official description of a serial killer is: a person who murders three or more people, usually in service of abnormal psychological gratification, with the murders taking place over more than a month and including a significant period of time between them. After my initial disgust of even imagining somebody wanting to kill another human being, my mind started to tick, and I started to research deeper into the crimes themselves rather than the thoughts running through their heads. The most famous parts of these crimes that all of the public can see whether willingly or not, are the crime scene photos, some of the most infamous being the St. Valentine’s day Massacre, the Most Beautiful Suicide, the Black Dahlia, and more. Most of these photos are much too graphic to show for obvious reasons whether you can gather why off of the names of these crimes/photos alone or if you want to look at them yourself but I do not recommend it if you have a weak stomach; you have been warned. Forensic photography documents both suspected and even convicted criminals as well as the crimes scenes, the victims, and other evidence which may be used in the conviction. Though photography was well-known as the best possible way to really depict people and objects, it wasn’t really acknowledged as a way of identification in forensics until the late 19th century. The earliest photo identification of inmates dates back to the mid-1800’s in Belgium and Denmark, though only an experiment for the filing of prisoner IDs. The french photographer who changed the world of forensic photography by realizing that these photographs are pointless without using the same lighting, angles, and scales for all of the photos was named Alphonse Bertillon. For general identification photographs at a crime scene you should take photographs of the left and right profiles of the face, and a frontal view before and after cleanup. You should also take these same photographs after the embalming for more pronounced features/wounds. For photographs of the clothed body you should take a series of general view photographs to show the appearance and condition of all clothing, and for close-up views you should take close photos of areas containing trace evidence or damage to garments, and if any patterns of damage are shown, photograph them with and without a scale in view. For photographs of all trace evidence take photos of each piece of evidence with and without a measurement scale in view; the notes and sketches of the location of each item should be photographed because this will help in the documentation of the location and appearance of each item which had been photographed and collected as well as noted and sketched. For photographs after clothing removal, you need to have photos with a general view of the body including all body surfaces on both front and back of the body. The scalp should also be photographed before and after being shaved. Close-up photos of all body areas will help to provide greater detail of surfaces with the documentation relating each photo a specific area of the body. Sketches of these photos or the body can help in clarity. Close-up macro photos of all wounds with and without a measurement scale should be taken with the location and orientation of individuals wounds in mind, keeping a level plane with each to help aid in later crime scene reconstruction. Trace evidence should be photographed before removed and placed into evidence bags. Gunshot wounds should be photographed with and without measurement scales, the camera positioned normal to the body surface, the wound centered in the photo. Each wound should be photographed with a probe in place and taken from the head of the victim with the plane parallel to the shoulders and from the side with the plane parallel to the long axis of the body. The camera's line of sight should be aligned with each probe. All in all there are many different techniques that go into Forensic photography which has been around for a very long time and is still improving day by day in helping to document these crimes as well as helping to bring justice to the victims involved. Photography is one of the leading variables in crime scene reconstruction, and will most likely continue to be for a very long time. Sammi Spellman made a digital story about CJ careers & CSI procedures intertwined with personal insights.